Finally, we test the world’s most anticipated side-by-side! 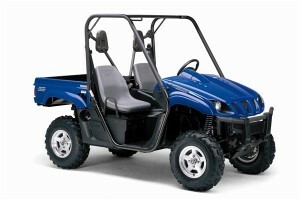 In 2004, Yamaha created the recreational side-by-side segment with the release of the Rhino 660. In 2004, Yamaha created the recreational side-by-side segment with the release of the Rhino 660. Four years later, Polaris leaped into the game with the first, purely sport-focused RZR 800, followed yearly by one new model after the other. Next, Can-Am and Arctic Cat jumped in, looking to grab their share of the booming sport market. 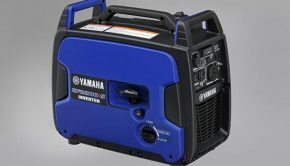 Meanwhile, Yamaha was left reeling from the challenges that often face companies that create an all-new, new product or segment. The 2016 model year marks Yamaha’s 60th anniversary, and the company has celebrated in the best way possible, with lots of new and exciting product offerings across their entire powersports lineup. 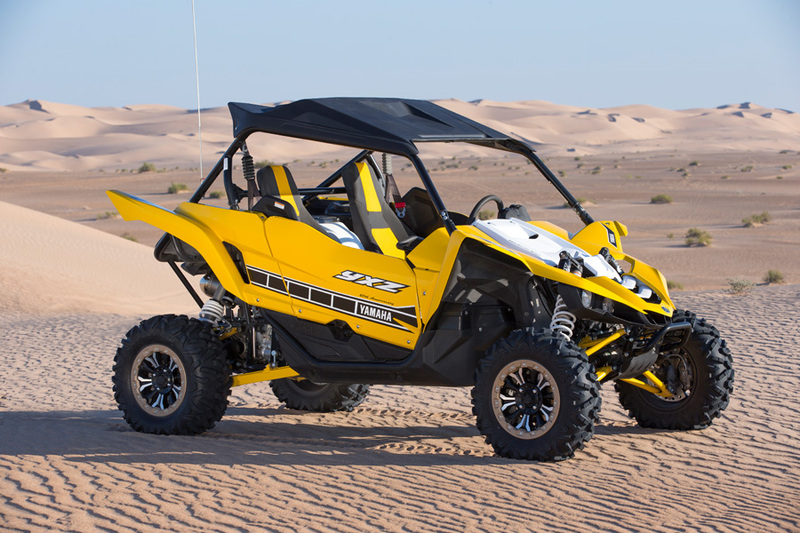 The biggest news by far came at their Sept. 1st world launch of the brand new 2016 YXZ1000R, that Yamaha proclaims as the world’s first, true, high-performance side-by-side. While we are pretty sure that ship has sailed, Yamaha has definitely changed the game and is clearly focused on racing to the front of a segment that they played a pivotal role in helping create. If the machine’s specifications weren’t enough to convince us, our first ride-along opportunity on Sept. 1st certainly did. Finally, Yamaha has given us the opportunity to step into the driver’s seat. 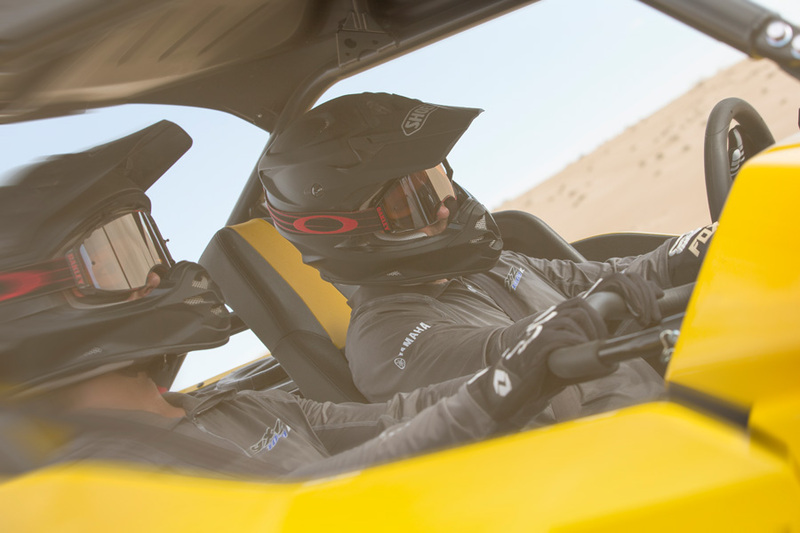 For this very special occasion, we sent our most experienced and knowledgeable side-by-side test driver, CT Racing Engine’s owner, Allen Knowles, to pilot the machine at the dunes of Glamis in California. Finally, Yamaha has given us the opportunity to step into the driver’s seat. at the dunes of Glamis in California. 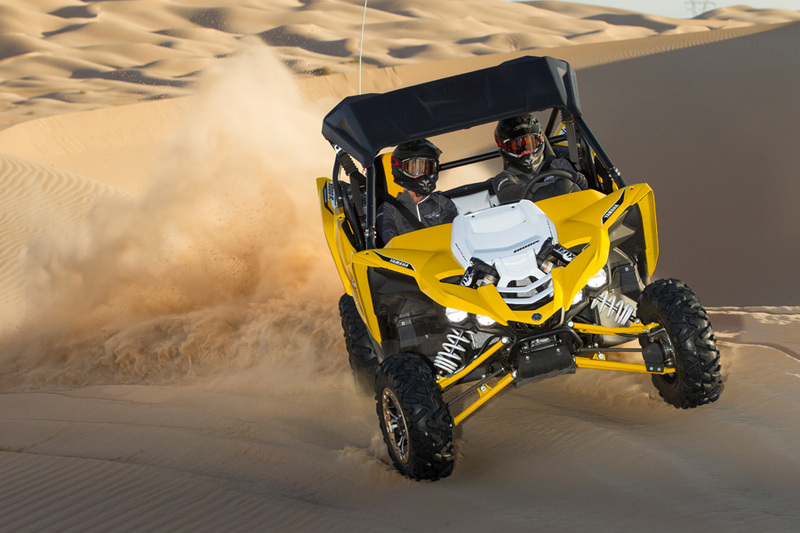 The YXZ1000R is powered by a 998cc, inline, three-cylinder engine featuring four valves and double overhead cams per cylinder. It produces 112hp and revs to 10,500 RPMs. 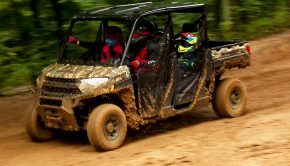 The YXZ1000R is powered by a 998cc, inline, three-cylinder engine featuring four valves and double overhead cams per cylinder. An 80.0mm bore and 66.2mm stroke indicate a motor that’s built to rev, redlining at 10,500 RPMs. 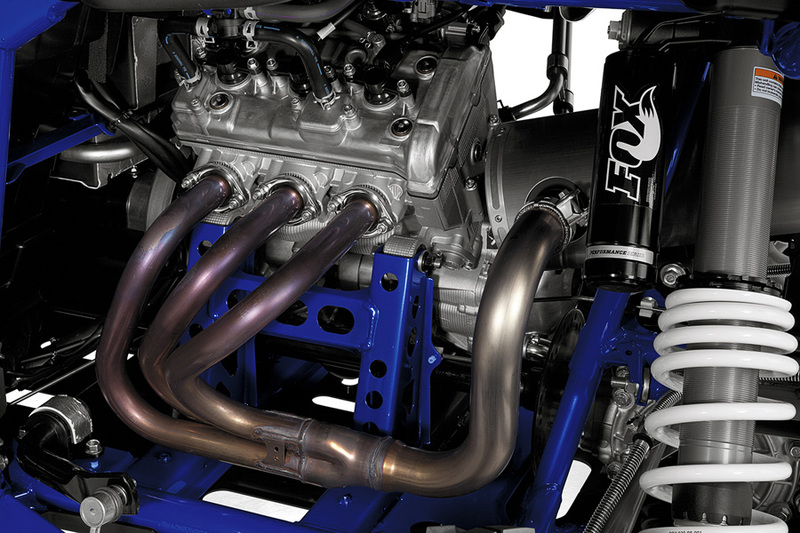 Fuel injection delivers air and fuel to the combustion chambers via three 42mm Mikuni throttle bodies. 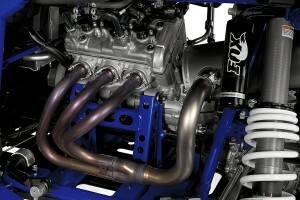 The engine is said to produce 112 HP, making it the most powerful, naturally-aspirated UTV engine on the market. The engine draws air from the cleanest possible place, high between the driver and passenger seats. 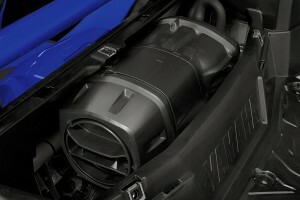 The intake features two inline filters for maximum air filtration. The engine draws air from the cleanest possible place, high between the driver and passenger seats. The intake features two inline filters for maximum air filtration. First, there’s a foam filter followed by a wet paper filter. The foam filter is easy to remove for regular servicing, helping maximize intervals between which the paper filter needs replaced. The engine is mated to a 5-speed manual transmission with reverse. The hydraulically-activated clutch is controlled by an automotive-style foot pedal. The drive system features two-wheel-drive, four-wheel-drive with limited slip front differential, and four-wheel-drive with front differential lock. The engine is mated to a 5-speed manual transmission with reverse. You could cruise along at lower RPMs, but making time in the power-robbing sand requires you to work the gear box to keep the engine up in the RPMs. 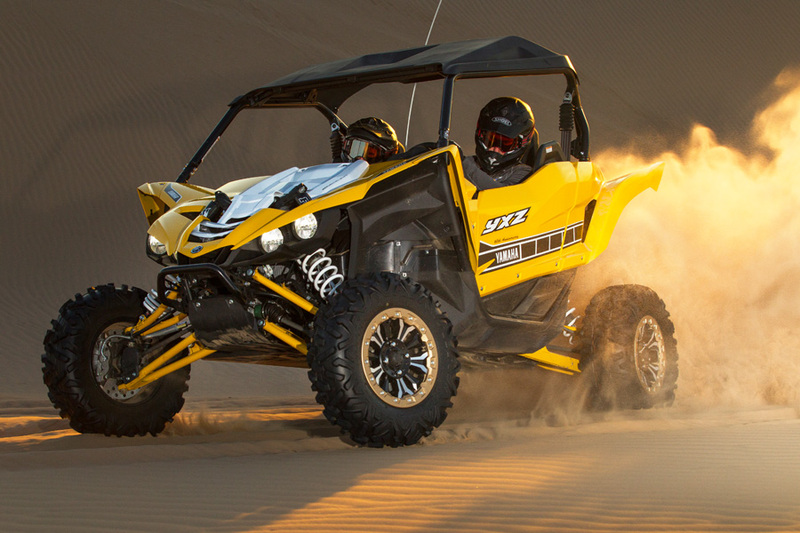 A shout out to the ATV crowd–– if you liked the Banshee, you’ll love the YXZ1000R. If you prefer the Raptor 700R, you might want a little more bottom-end power. 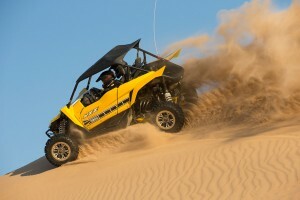 Not only does the YXZ1000R sound like a road race motorcycle, its engine delivers the same kind of performance. Low-end power is smooth and mellow. The engine’s well-tuned fuel injection and engine inertia make it difficult to stall. The car will accelerate at lower RPMs, but not with a lot of authority. The power continues to build with a smooth, mellow delivery until you reach the upper midrange. At 7000 RPMs, the engine really comes to life, pulling hard all the way to redline at 10,500 RPMs. if staying in touch with the engine, banging through the gears and letting it rip are what you are looking for in a side-by-side, then the YXZ1000R is the only machine for you. On harder surfaces,less drag being placed on the engine allows it to more easily work its way into the meat of the power, requiring less precise shifting than in deep sand. You could cruise along at lower RPMs, but making time in the power-robbing sand requires you to work the gear box to keep the engine up in the RPMs. Upshifting around 10 grand seemed to keep us in the sweetest part of the power when we grabbed the next gear. The clutch pedal’s action was light as was the precise feeling shifting. We felt the manual transmission worked beautifully–– a good thing as the high-strung engine likes to keep the driver involved. From what we experienced on the hard-packed dirt track at the world launch in September, less drag being placed on the engine allows it to more easily work its way into the meat of the power, requiring less precise shifting than in deep sand. 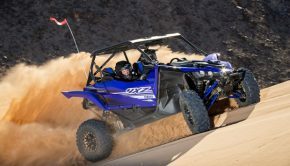 While Yamaha states that the YXZR was designed for the dunes and wide open trails, we know people will take it everywhere else under the sun. In slower, rocky, technical situations, we could see ourselves working the clutch a lot and wishing for a bit more torque. 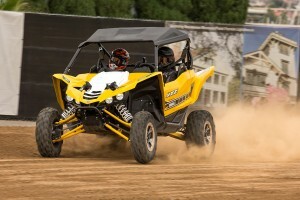 The YXZ1000R has a high-performance engine, and it really prefers to be driven that way. Four-wheel-drive engagement was smooth. We repeatedly engaged and disengaged it on the move with a light lift of the gas pedal. In the dunes, we never saw the need for differential lock, but love the idea of having it there for tough trail sections. 26” front and 32”rear, Fox Podium 2.5 RC2 shocks control 16.2” of travel up front and 17” of travel out back. 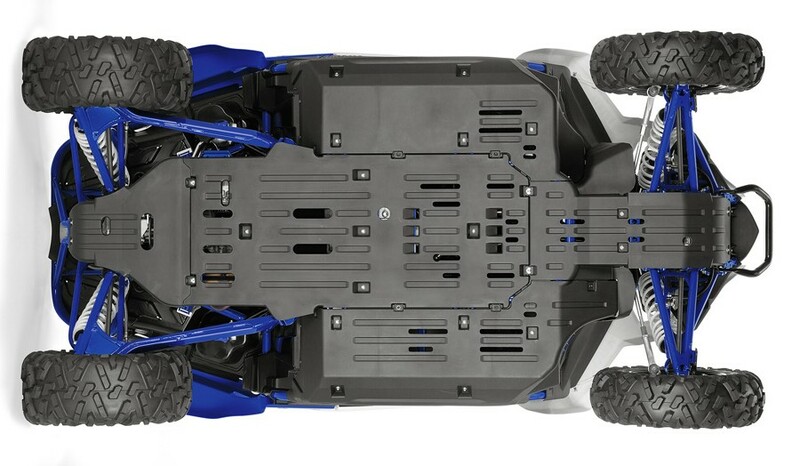 The YXZR is built on a brand new, tubular steel chassis, protected by a full frame underbody skid plate. The frame mates up to dual A-arms at both ends. The rear A-arms are designed to morph the function of trailing arms with the strength and rigidity provided by dual A-arms. Sway bars are equipped at both ends to control unwanted body-roll. 26” front and 32”rear, Fox Podium 2.5 RC2 shocks control 16.2” of travel up front and 17” of travel out back. Their progressively wound, dual-rate springs feature preload adjustability, in addition to high and low-speed compression damping, plus rebound damping adjustment. The rear shocks feature Fox’ anti-bottoming technology, designed to help prevent a jarring metal-to-metal sensation when they bottom out. 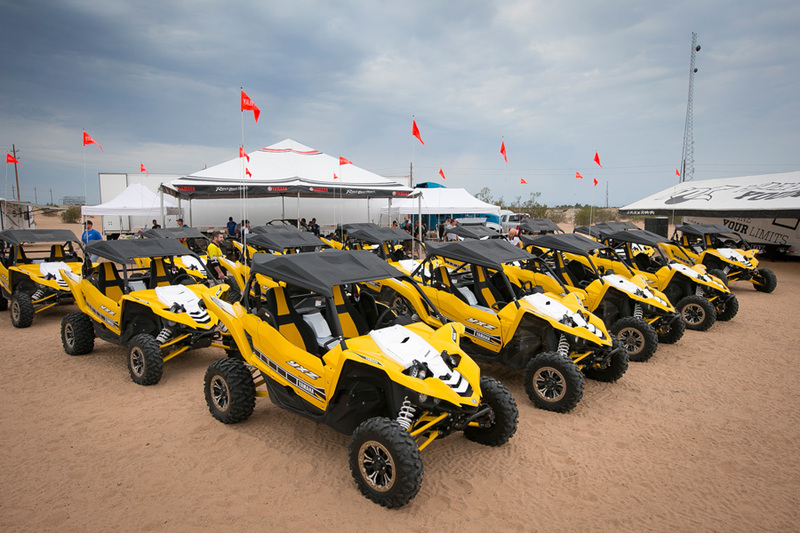 Speed-sensitive, electric power steering comes standard on all YXZRs and is mounted high on the rack-and-pinyon steering system helping protect it from dirt and debris. Fully adjustable 26” front and 32”rear, Fox Podium 2.5 RC2 shocks control 16.2” of travel up front and 17” of travel out back. 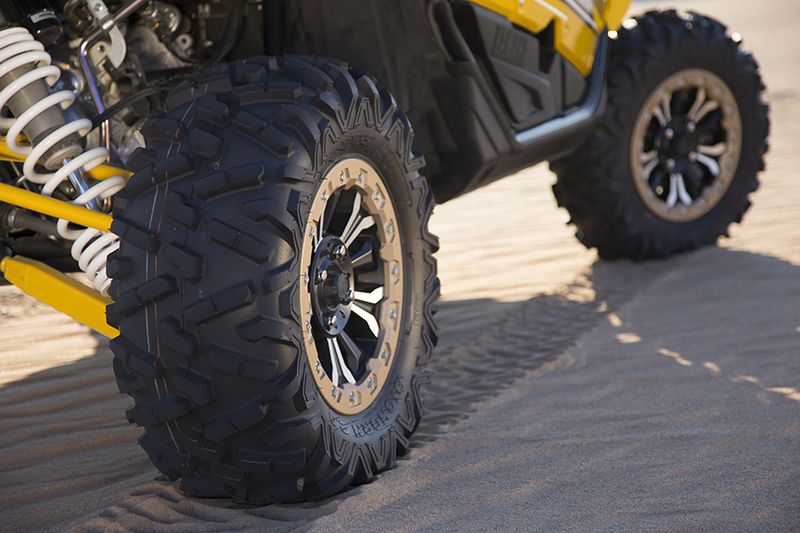 Traction is provided by a special version of Maxxis, 27” Bighorn 2.0 tires, developed specifically for the YXZ1000R. The Special Edition model we tested enjoying the extra durability and run-flat security of beadlocks. Traction is provided by a special version of Maxxis, 27” Bighorn 2.0 tires, developed specifically for the YXZ1000R to maximize ground clearance, traction, handling, and durability. The tires are mounted on aluminum wheels on the base model YXZR, with the Special Edition model we tested enjoying the extra durability and run-flat security of beadlocks. 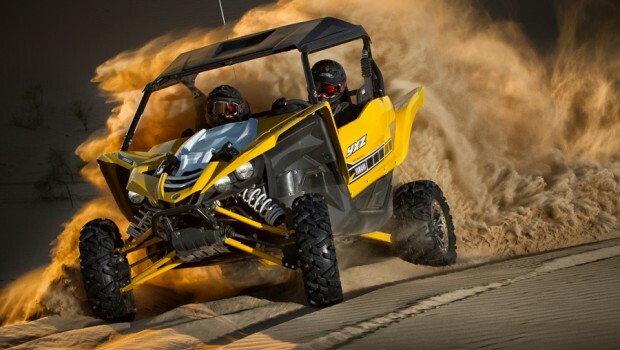 The YXZ1000R measures in at 64″ wide, with a wheelbase of 90.6″ and 12.9″ of ground clearance. Handling performance lived up to the hype in the dunes. Steering effort was light in the deep, heavy sand thanks to the EPS system. It remained light in limited-slip four-wheel-drive, but became a bit stiffer with the front differential locked. Steering accuracy seemed very good, but is a little harder to fully evaluate in the sand. 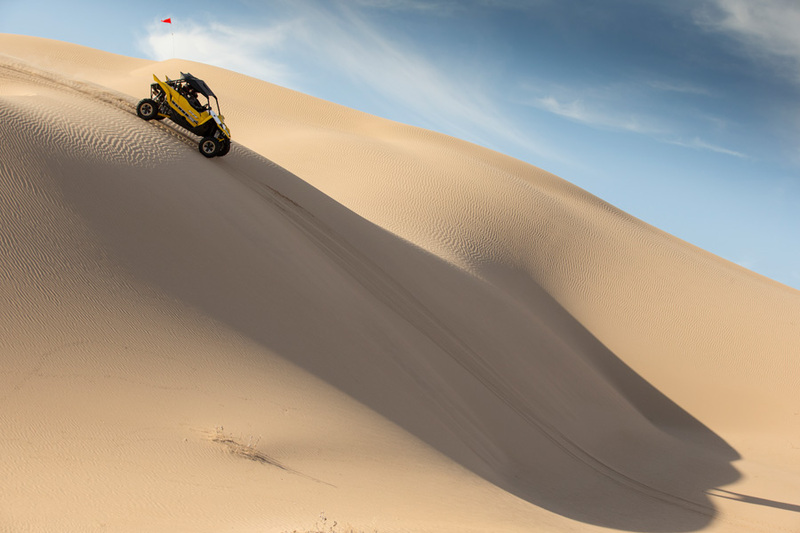 Handling performance lived up to the hype in the dunes. Steering effort was light in the deep, heavy sand thanks to the EPS system. Stability is very good both in corners and on side-hills. We’d say it’s more stable than any of the other base model 1000cc cars on the market, and on par with the $25,000, dual swaybar-equipped Fox Podium Edition, or RZR XP 1000 Turbo. High-speed stability was also quite good. Stability is very good both in corners and on side-hills. If suspension performance is important to you, you won’t be disappointed. Out of the box, the factory suspension settings were pretty good. However, the front end felt just a bit heavy and the rear end deflected a bit on high-speed whoops. Fox’ on-site technicians stiffened up the front shocks’ low-speed compression about 15%, added a few clicks to rear low-speed compression damping, and slowed down the rear rebound a couple clicks. The result was a car that tracked straight through the whoops and carried the nose a little higher off whoops and jumps. Overall, the suspension seems to be very well rounded, doing a good job of eating small chatter while feeling bottomless. There is an abundant amount of external adjustment provided by the Fox Podium shocks, so dialing in the exact ride you are looking for shouldn’t be a problem. Overall, the suspension seems to be very well rounded, doing a good job of eating small chatter while feeling bottomless. The purpose-built Maxxis Bighorn 2.0s delivered surprisingly good traction in the sand; so much, Al left the car in two-wheel drive half the time. Forward braking and directional control were well balanced, and they seemed to perform equally well on the hard dirt at the car’s launch last month. 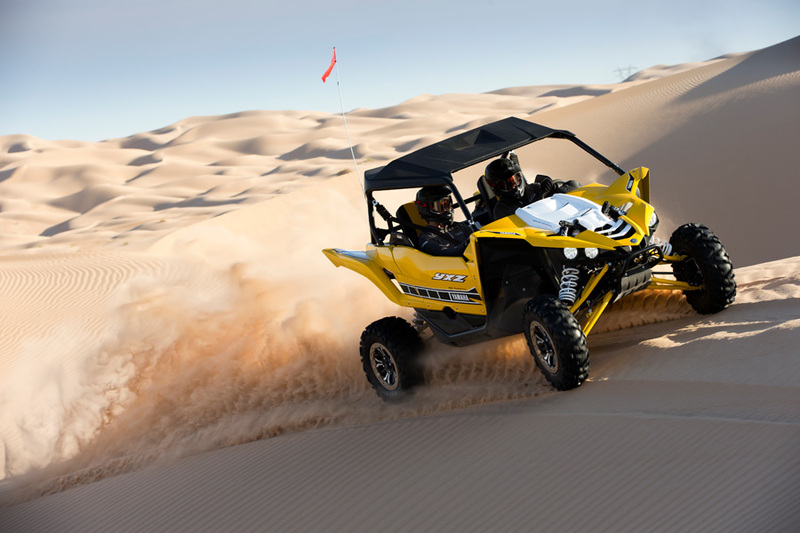 The YXZR is slowed by hydraulic disc brakes featuring 245mm rotors and dual-piston calipers at all four corners. 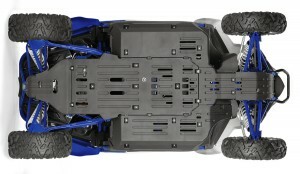 The YXZR is slowed by hydraulic disc brakes featuring 245mm rotors and dual-piston calipers at all four corners. They offer good feel at the pedal, and while sand makes judging their full power difficult, they proved to be able to rapidly scrub off speed in our previous encounter on dirt. 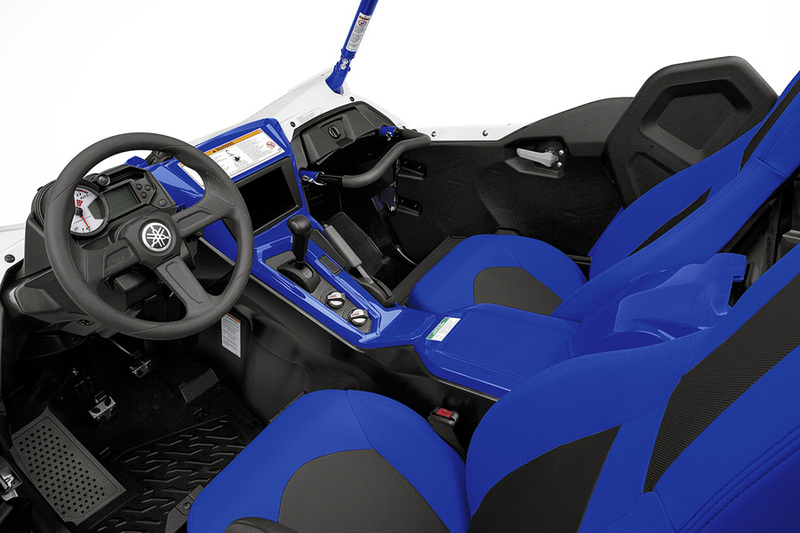 The YXZ1000R cab features plush, high-back seats with extra lateral support and outside shoulder bolsters. Welcomed features like well-built full doors and a sunroof are standard equipment. We dig the doors, but the roof sight line was a little low for looking up the sides of steep dunes. On the flip side, the steep hood provides superb visibility of what’s going on directly in front of the car. The YXZ1000R cab features plush, high-back seats with extra lateral support and outside shoulder bolsters. Both the driver’s seat and passenger handhold are adjustable, in addition to the steering wheel, which features 5.8”of tilt adjustment. Both the driver’s seat and passenger handhold are adjustable, in addition to the steering wheel, which features 5.8”of tilt adjustment. Inspired by Yamaha’s high-performance supersport motorcycles, the dash-mounted instruments feature a combination digital and analog display with a speedometer and tachometer, in addition to the other usual fuel and trip distance information, plus the addition of a very cool, programmable, shift indicator light. After 30 years of off-road racing and riding, Allen’s body has become a comfort dynamometer. He was able to configure the cockpit to fit his 6’4” frame, and had no issues with any points of discomfort at the end of the day. The car rates high at all points of contact including the steering wheel, foot pedals, and shift lever. With the absence of any Japanese manufacturers in the high-performance segment, a higher level of fit and finish are perhaps what people have been wanting far more than anything else. No wood screws here; the YXZ1000R uses high-quality fasteners. 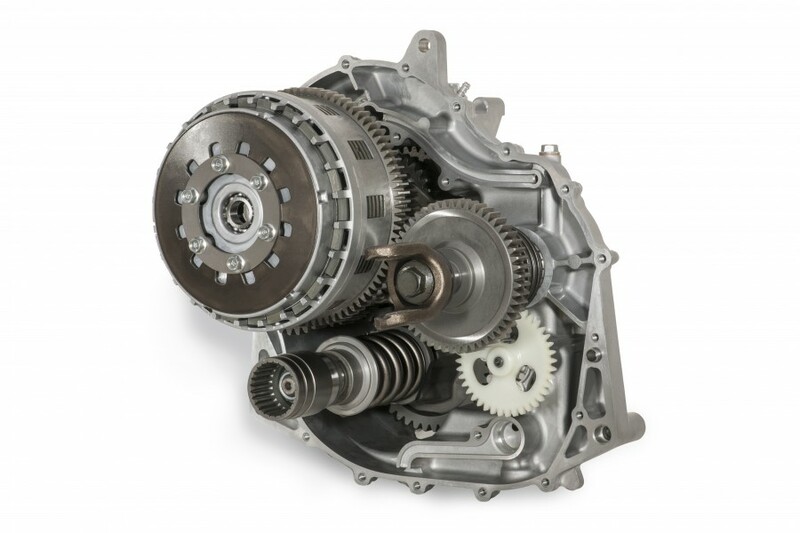 Its transmission and multi-plate, wet clutch appear overbuilt and should hold up well to abuse. Nearly every visual aspect of the car looks well-thought-out and refined. 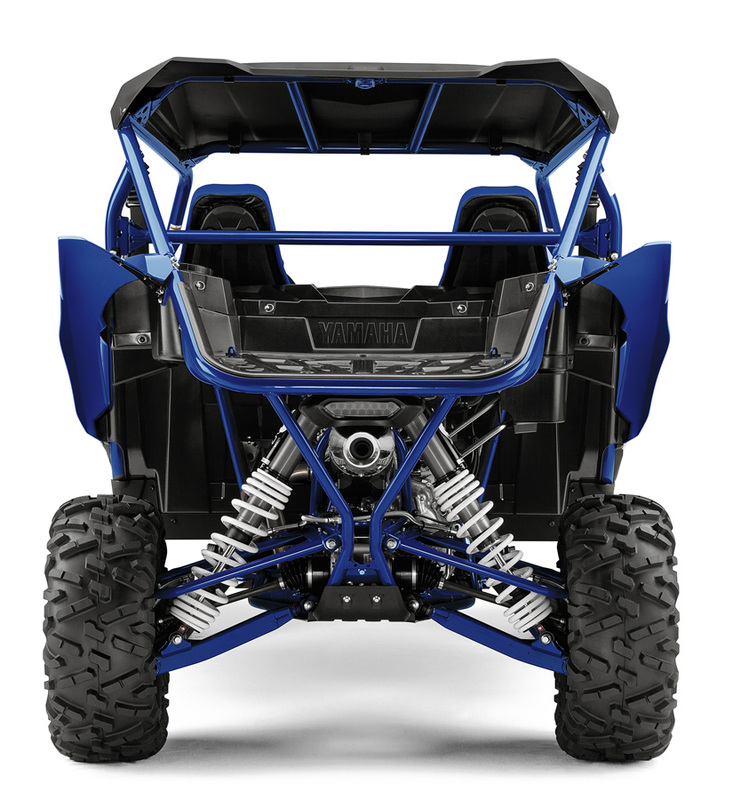 No wood screws here; the YXZ1000R uses high-quality fasteners. Its transmission and multi-plate, wet clutch appear overbuilt and should hold up well to abuse.Nearly every visual aspect of the car looks well-thought-out and refined. 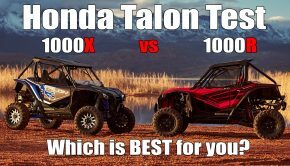 Yamaha’s new 2016 YXZ1000R is certainly a high-performance machine with all the power, suspension, and good handling qualities to match. Its manual shift transmission adds a cool aspect of performance and control that’s been missing from the entire side-by-side industry. Its shrieking, three-cylinder engine seems to rev faster and higher than any of its competitors. A bit more low-end torque would make relaxed driving a little easier, but if staying in touch with the engine, banging through the gears and letting it rip are what you are looking for in a side-by-side, then the YXZ1000R is the only machine for you. 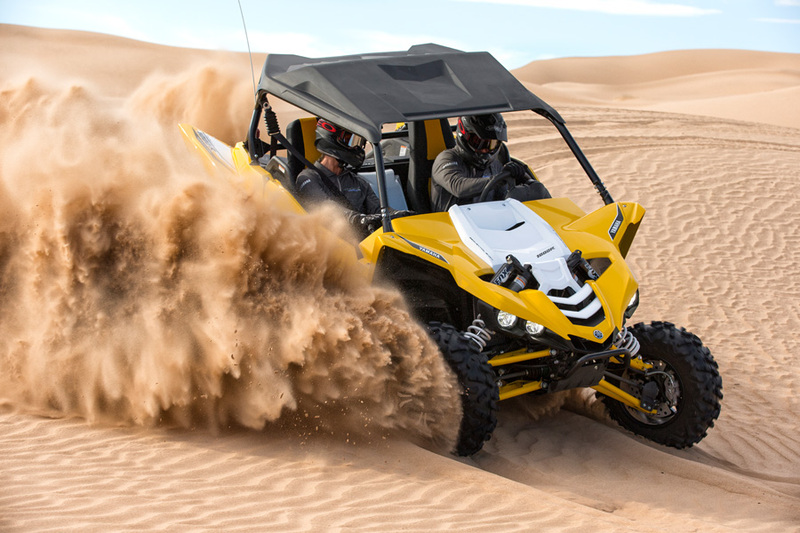 Summary: Yamaha’s new 2016 YXZ1000R is certainly a high-performance machine with all the power, suspension, and good handling qualities to match. Its manual shift transmission adds a cool aspect of performance and control that’s been missing from the entire side-by-side industry. Its shrieking, three-cylinder engine seems to rev faster and higher than any of its competitors. 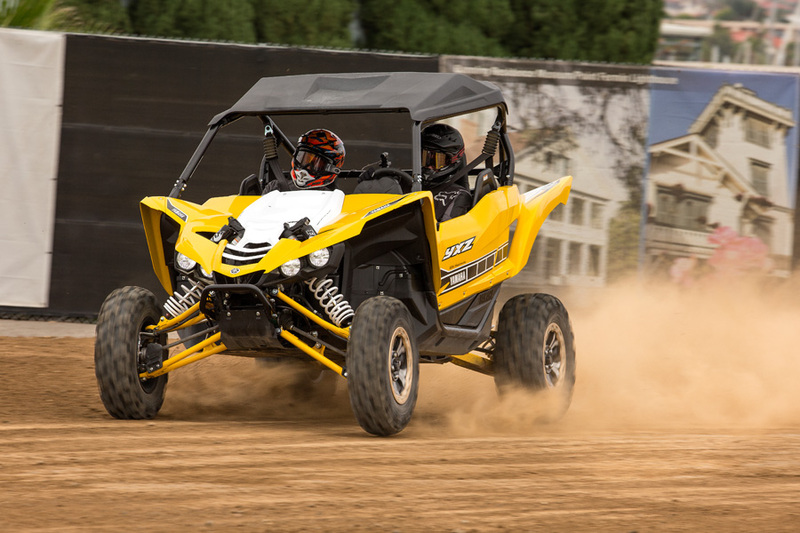 A bit more low-end torque would make relaxed driving a little easier, but if staying in touch with the engine, banging through the gears and letting it rip are what you are looking for in a side-by-side, then the YXZ1000R is the only machine for you.